Artichokes: the ubiquitous filler that’s served in spinach dips throughout sports bars and portion-cup restaurants everywhere; those cretaceous-looking flowers that could be Audrey’s evil offspring in the Little Shop of Horrors; and a veggie that I no longer avoid eye contact with when wandering the produce section thanks to a little online research. I have embraced the green bud because of how simple it can be to prepare, how surprisingly nutritious it is and how tasty it can be. I’ve come to enjoy the ritual of eating an artichoke, starting with the chewing of the pulpy petals; the scraping away of the choke; and then finally, the reward of the delicious heart. Here are 10 questions from Donna Plough, co-founder of Glen Valley Farms, who – with her husband John – has been growing the vegetable for years, out on their organic, 20-acre farm east of Fort Langley. Foodists: How many artichokes does Glen Valley Farm grow? Donna: We’ve been growing artichokes for at least 15 years now and we plant about 30,000 seeds each year. Foodists: Are they difficult to grow? 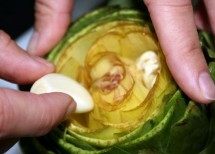 Donna: Artichokes north of the 49th parallel are tender perennials so it depends upon our winter if they return or not. They are more finicky than difficult to grow and seem to adapt to different soil conditions. 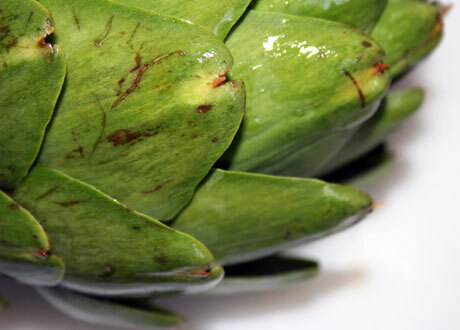 Foodists: What’s the most popular question you get about artichokes? Donna: The most popular question is, “How do you cook them?” There are many ways – we do the easiest and that is to boil or steam them. Foodists: Do you find them as freaky-looking as I do? Donna: They are intimidating and I admire the first person who did eat them. They are an old vegetable from the time of Jesus and were made popular in the 15th century. Donna: Yes. Artichokes are very healthy for you – it’s what you dip them in that causes the problems. To name a few healthy things, they detoxify your liver, and they have calcium, magnesium, vitamin C, folic acid, and antioxidants. 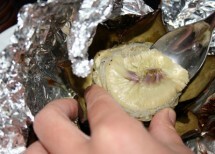 Foodists: Can you make alcohol out of artichokes? Donna: I’m not sure about making alcohol, but in Europe they do make a liquor to calm your nerves and in Thailand they make artichoke tea. 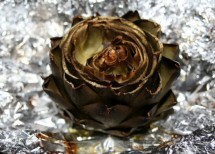 Foodists: Has an artichoke ever hurt you with its pointy petals? Donna: Yeah, some artichoke brackets have thorns on them and these can get into your skin and cause irritation. Foodists: What’s your favourite thing about artichokes? Donna: Other than eating them, my favourite thing about artichokes is their flower – it’s amazing and lasts for a long time. Foodists: What’s your favourite way to eat artichokes? Foodists: Do you know any good artichoke jokes? Donna: There is one about a man who chokes his two wives and the headlines read, “Arti chokes two for the price of one.” Sorry, not a good joke – not really funny. Wash artichoke under cold water. Cut off the stem, trimming about 2.5 to 3 centimetres off the prickly top as well. 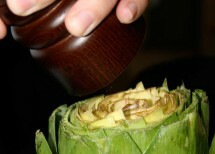 Place and the artichoke on its base and gently, using your thumbs, spread the petals outward. Place the artichoke in the centre of a large square of tinfoil and drizzle a good oil over the top – I like extra virgin olive oil or macadamia nut oil. Lightly season the top with sea salt and fresh-ground pepper. Insert a few peeled garlic cloves or fresh basil leaves in between the petals. 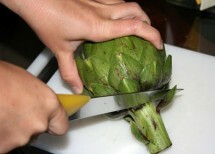 Squeeze fresh lemon juice over the artichoke. 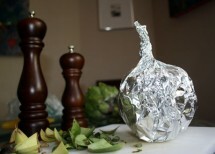 Wrap the tinfoil around the artichoke securely so that no steam – or flavor – escapes. Place on a baking sheet and into the oven at 450 degrees Fahrenheit for about 1 hour. Pick the individual petals off, chewing and scraping the tender, fleshy part off of the base. Once the petals have been taken care of, you will reach the hairy looking choke. The choke has a delicious flavour of quinine and Treebeard’s bum as well as the appealing texture of unbrushed horse hair. Needless to say, gently scrape away the choke with a spoon or butter knife – and it actually comes off quite easily. 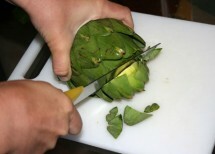 Once the choke has been removed, you are now left with the delicious artichoke heart. I personally like dipping the heart into tzatziki or herb-infused olive oil, but is also good on its own with minimal seasoning. Thanks for featuring us! Our crop is delayed this year due to the weather but we should have fresh artichokes in the markets at end August.